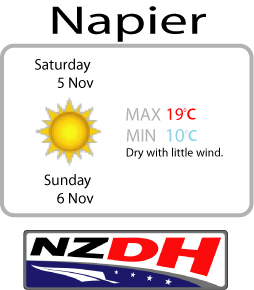 Weather outlook is very motivating for this weekend in Napier. NZDH Round 3 is looking like we will will have a fine weekend throughout!! This entry was posted on Monday, October 31st, 2011 at 8:38 am and is filed under Uncategorized. You can follow any responses to this entry through the RSS 2.0 feed. Both comments and pings are currently closed.